Weak production dynamics in key shrimp-producing nations has helped India to remain the largest exporter to United States of America (USA) for four years on the trot. The major producing economies which India has piped are Indonesia, Thailand and Ecuador. US is the largest market for India. Indian shrimp exports to US has witnessed a robust compounded annual growth rate (CAGR) of 25.2 per cent between the calendar year 2014 and 2017, outpacing USA’s shrimp demand CAGR growth of 7.1 per cent during the same period. The consistent performance of India in exporting shrimps to US is driven by the strong uptick in demand for Indian shrimp coupled with weak production dynamics in other major shrimp producing nations such as Thailand and Vietnam. "Over the last four fiscals, growth in USA’s shrimp imports from India has consistently outpaced the growth in USA’s overall imports and imports from Indonesia, Thailand and Ecuador. The same is visible in the increase in India’s contribution in USA’s shrimp imports from 19 per cent in calendar year (CY) 2014 to 36 per cent in 10 months of CY2018, substituting Thailand, whose contribution declined from 11 per cent in CY2014 to seven per cent in 10 months CY 2018, and Vietnam ( from 13 per cent in CY2014) to eight per cent per cent (10 months of 2018)", ICRA stated in a report. However, the rating agency has a warning for Indian exporters. “Despite the robust growth in shrimp imports from India, the country faces stiff competition from Indonesia and Ecuador whose export contribution during 10 months of FY 2018 has increased, supported by the increasing shrimp production in the respective countries”, the rating agency said. India is expected to benefit from the sanction imposed by USA on China coupled with increasing import of value-added shrimp by USA, leading to a growth of about seven to 10 per cent per annum in CY 2019. The effect of implementation of Seafood Import Monitoring Programme (SIMP) for shrimp exports to USA from January 1, 2019 will be a key monitorable. “Going forward, Indian exporters face stiff competition from Ecuador, Indonesia and Vietnam. A strong uptick in major shrimp production since CY 2017 has intensified competition amongst leading global shrimp exporting nations. 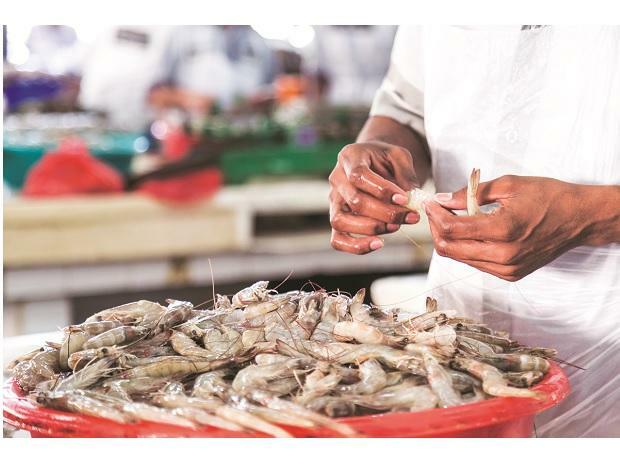 ICRA expects increasing shrimp production amongst the top shrimp-producing nations to cause demand-supply mismatches inducing volatile in prices,” Pavethra Ponniah, vice president and sector head - corporate sector ratings, ICRA said in a recent note.